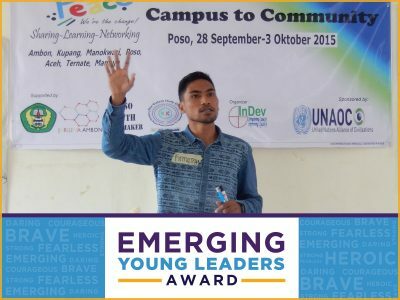 Zulfirman received the Emerging Young Leaders Award in April 2016 and ever since he has been busy training to facilitate Non-Violence Study Circles on university campuses in Ambon, Indonesia. Non-Violent Study Circles (NVSC) was formed in 2011, after radical demonstrations by students showed religious discrimination at Pattimura University (UNPATTI. In May 2016, Zulfirman and some friends facilitated an annual TOT workshop for 30 UNPATTI students at a three-day residential program. In August 2016, he conducted a similar program for 28 students at Institute Agama Islam Negeri – IAIN Ambon (Islamic State University Ambon). Since Zulfirman joined the network in 2012, he is one of the most active members. He not only strengthens the network in Ambon but has also introduced NVSC thru national and international events, including Interfaith Youth Pilgrimage Indonesia in 2013, Indonesia Youth Interfaith Peace Camp and Peace through Environment: Save Ambon Bay Forum in 2014. The Emerging Young Leaders Award was the first international recognition. Most recently he was a speaker at the International Conference toward Inclusive Religious Education in the Netherlands and Indonesia August 2016. Thank you Zulfirman for finding practical ways to build peace and address ts using a campus to community model. You and your teammates have showed great sensitivity adapting program models and topics to address specific needs.